Wow, a very dramatic outcome. Macer is at a loss. 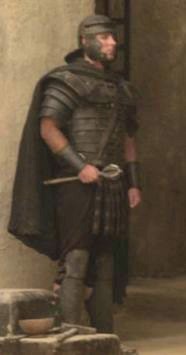 It started in that cestus fight with Isaac, Macer mused. Since that time, Kemsa was not the same, he must have been bewitched by that cult out of Judea. On the other hand, he was very pleased with Mago. That trident is quite special. Macer told Mago that is was tempered by the blood of a 3 year old goat, giving it’s wielder good fortune. Mago wins 9 gold, after deducting 1 upkeep for the child, Mago’s savings are now 35 gold. Blaming everything on Noctua, Macer decides he will spike the wines in Noctua’s ludus so that his gladiators will be too ill to fight in the next games. Samasu’s sources have learned who Noctua’s wine merchant is. The plan is to somehow intercept the next wine delivery on route and put a herbal mixture into it that causes extreme stomach pain for a week. Samasu has the pouch with the herbs, Mago is to go as “security” in case something goes wrong. Both are cloaked and it is late evening. Unexpectedly, the wine cart left early and got to the outside of Noctua’s ludus by the time Samasu spotted it. 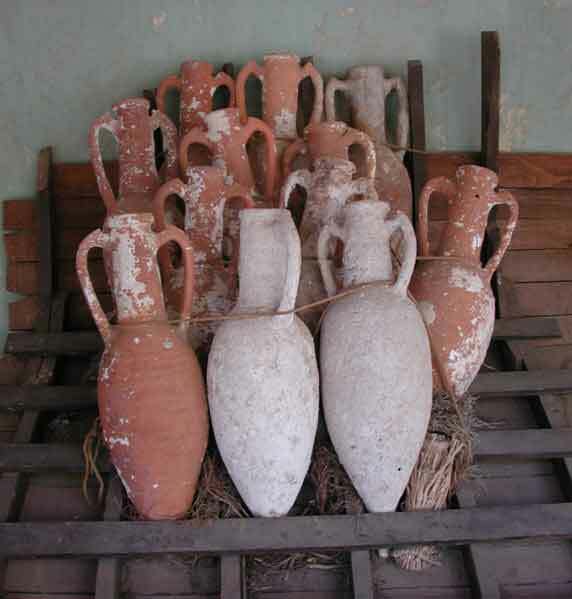 It was full of amphoras (earthenware jugs). The merchant was greeted by two armed guards of Noctua who started talking about the wine. While distracted, Samasu snuck up to the back of the cart with his pouch full of herbs, while Mago hid out of view around a corner. Samasu was trying to remove a cork seal on one of the amphora’s when one of them fell, making a loud noise. “Thief!” screamed the merchant as the two armed guards turned around and advanced. Samasu had no choice but to grab an amphora (pretending to be a thief) and bolt, with the 2 guards on hot pursuit. The merchant was not far behind screaming “Thief! Thief! Get the wine back!”. Pick up the pouch, uncork the small amphora and empty the contents into it, recork and run back to Macer. To be a successful Retiarius, when it seems very every one you come up against in the arena is going to be more heavily armed and armoured than you, requires nerves of steel and lightning fast reactions. 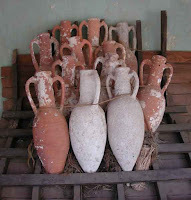 So it is no surprise that Mago moves fast, retrieves the packet of herbs, and empties it into the small amphora. He re-seals the amphora and slips quickly away into the shadows, back to Macer. Mago swiftly goes about his work. Just as he pushed the cork back into the small amphora, 2 more guards come out of the gates of Noctua’s ludus building with a man of rank. Mago has seen this man before in the stands, and recognises him as Noctua himself. Mago is stunned for a second, as Noctua yells out to Mago “we have been waiting for you, stop standing around and bring your masters cart in!” (the cart is a sort of large wheelbarrow). Mago has clearly been mistaken as a servant of the wine merchant. One of the guards asks “where are Corvus and Glabrio, they should have been out here?”. The second guard responded in a dismissive tone “those lazy sods are probably out gambling with dice again, they cheated that African gladiator of Macers really good last time!”. They all burst out laughing. Rush forward, draw out his gladius, attack Noctua and the guards, being offended at the slight and trickery against his deceased friend Kemsa. Oh dear this is starting to get dangerous and tricky. I mini gamed some options (dice rolled for probabilities) including trying to fathom why Kemsa and Mago had been so close. Turns out they were brothers, who had kept it a secret for fear of being split up and sold separately. This was factored into Mago's response to the options you set below. Mago rushes forward and attacks Noctua and the two guards. He blames Noctua for engineering the death of Kemsa, giving credence to what Macer has been saying.